Blueberries, Art and Life: Received My First Ever Project Card! Received My First Ever Project Card! Woo Hoo! Look what came in the mail! I joined a WC project "Vacation Dreams" (see post for July 25) and received my first card. How exciting it was to open the envelope knowing there was a piece of original art from someone in another state! 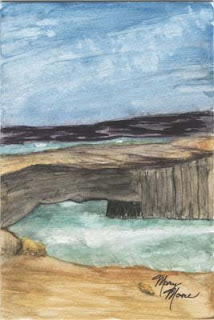 The beautiful watercolor scene is of a natural bridge in Aruba. Thank you, Mary... I love it! HOW NEAT, TEresa!! I will getback to your note soon -- it's been sheer madness here .... I HATE it when it's so insane! But what a neat neat card!! Hope you're keeping cool! And eating blueberries!